Rasmea Odeh appeal moves towards new trial | Fight Back! 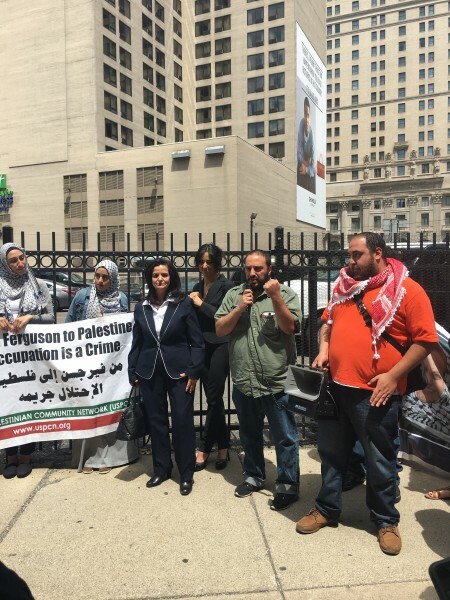 Detroit, MI - Over 100 supporters of Rasmea Odeh chanted her name in excitement as she emerged from the Federal Court Building in downtown Detroit on June 13. The crowd could see on Odeh’s face that she had good news. Slightly embarrassed by all the attention,she eventually waved for supporters to cross the street and join her for a press conference. Odeh and her defense lawyers met with Judge Gershwin Drain and the U.S. prosecutors in Detroit on June 13. Outside the court, more than 100 people picketed, chanted and gave speeches for three hours. whether it would lead to a new trial. Defense attorney Michael Deutsch announced, “There is a tentative date for a new trial on January 10 of next year.” This caused many in the crowd to smile and cheer as they realized Judge Drain was accepting the appeals court rulings. but U.S. prosecutors have blown it up into a political case. room for a defense argument in his courtroom. Mick Kelly of the Committee to Stop FBI Repression said, “The whole world knows about Rasmea because of our ongoing campaign. Our victories are adding up! This is a political trial carried out by an empire trying desperately to shore up an increasingly unpopular and unstable Israel. It is an injustice that charges were brought against Rasmea Odeh in the first place. So again we say, "Drop the charges now!"